Page 68 — Maggie arrives back aboard with a prize! It’s good to be back aboard The Mermaid! I’ve been working on two book projects for publication over the last couple of months, and while one takes place at the seashore (and under the waves) it’s no substitute for my own beloved comic. I’ve really enjoyed drawing Maggie’s little excursion (if you follow my other work, you’ll know drawing cats is one of my favourite things), and she will certainly have more adventures in upcoming chapters. In other news, I’ll be at the Saskatoon Comic and Entertainment Expo next weekend, September 17 and 18. If you’re coming to the event, look for me in Artist’s Alley! I’ll be right next to my friend k.d. prosser, of ThinkInk Comics! 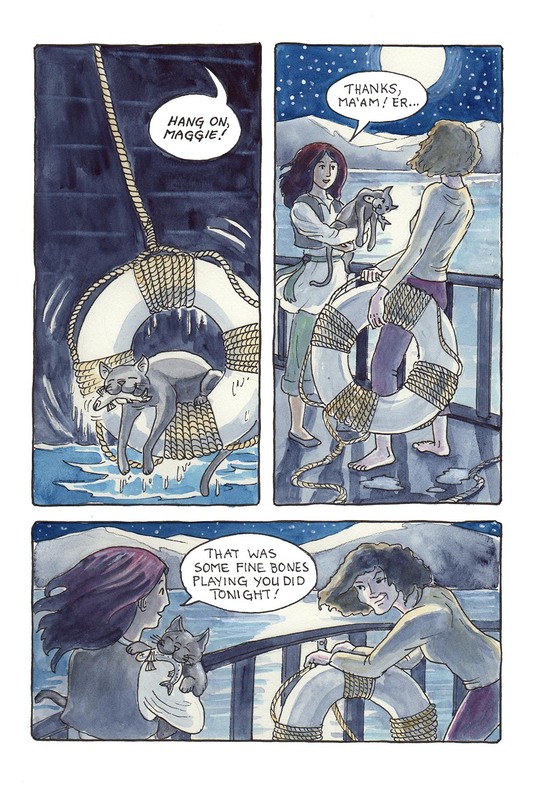 This comic was posted in Mermaid Music and tagged cat, comic, fantasy, graphic novel, mermaid comic, sailors, sea comic, ship, ship's cat, watercolour, webcomic.